Bon appetite to a HEARTY MEAL! A few pearls of green peas. Place the pan on medium heat .Put butter, allow it to melt a bit, add ginger, garlic, sauté them till just golden and add the tomatoes. Sauté further till tomatoes become nice and soft (ideally for 5 mins). Keep aside for a few minutes, for it to cool. In a blender; blend the cooled mix of ginger, garlic and tomatoes to a puree consistency. Then place a pan on medium heat. Pour the prepared puree and slowly pour in the milk for desired consistency, while stirring continuously (this is very important, if not stirred continuously the milk will tend to curdle in the tomato base). Once the desired consistency of the gravy is obtained, add garam masala powder, roasted cumin powder, kashmiri red chilli powder, sugar and salt to taste. Sprinkle some strands of saffron and leave some for garnishing. Stir in the cottage cheese (paneer) chunks. Give the paneer gravy a boil and remove from pan to serve. In a rice pot pour oil and add cumin seeds. When these start to sizzle, add chopped onion and sauté till the onions appear a bit glossy. Now add rice along with water and salt to taste. Cover tight and cook on low heat, until the rice gets cooked (15-20 mins approx). If using a pressure cooker, turn off the heat after 2 whistles and allow it stand (without opening the lid). 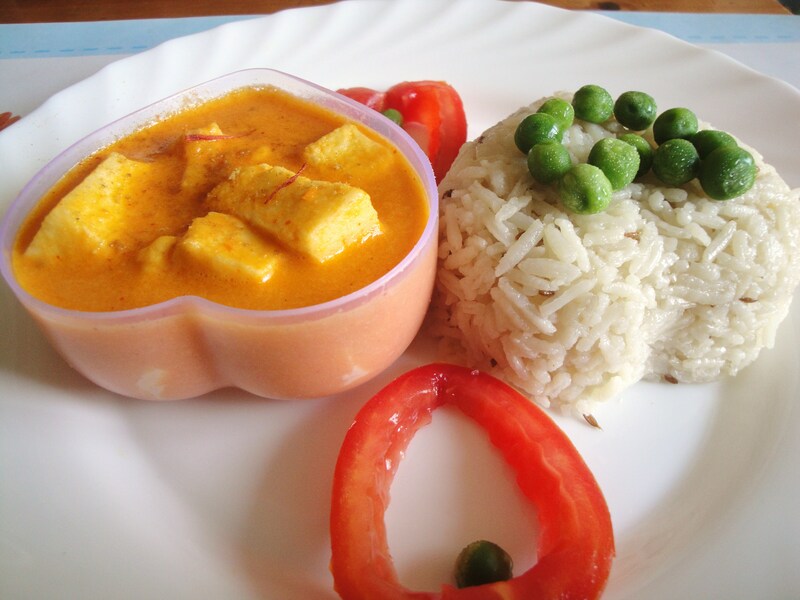 Dish in the rice and paneer gravy on a serving plate as shown in picture. 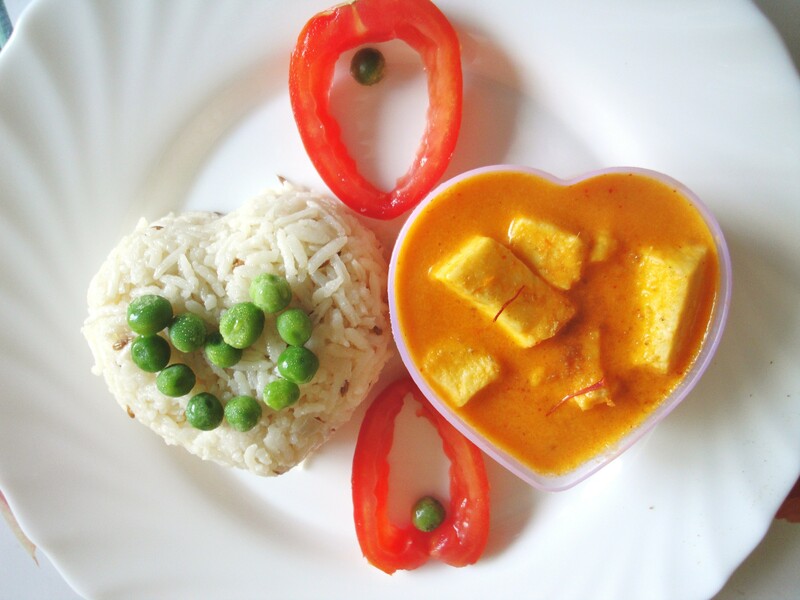 Garnish by sprinkling some saffron strands on the paneer gravy. 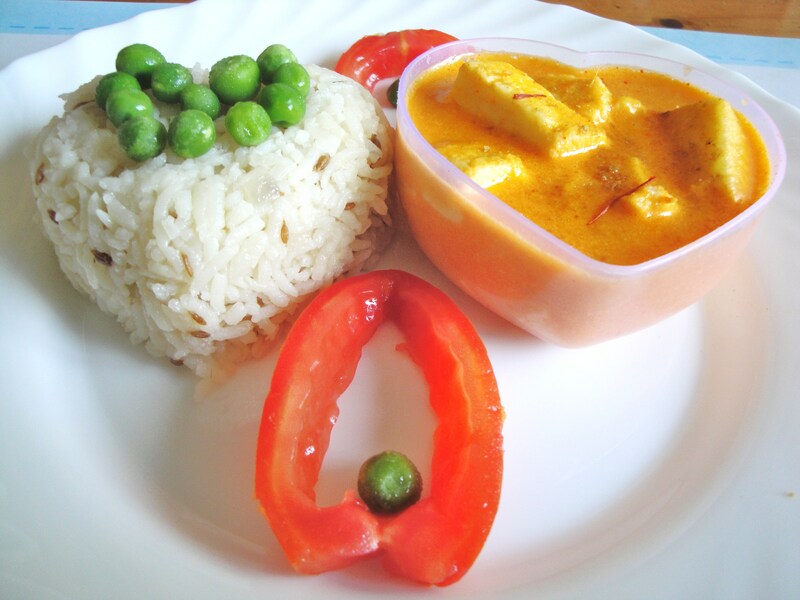 Decorate further with green peas and tomato slices as shown in the picture. Kiddie Tip: Add a tablespoon of fresh cream just before adding the cottage cheese to the prepared gravy. This would make it creamier.